Then Jesus turned to his followers. They were there alone with him. 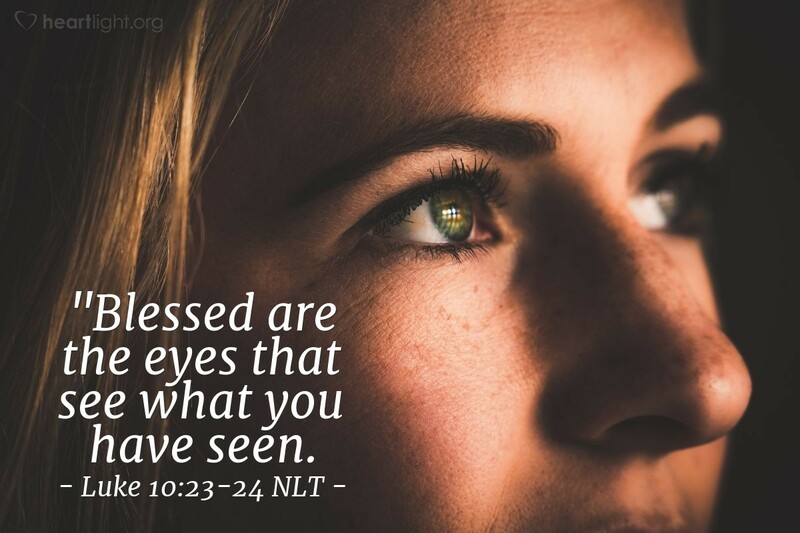 Jesus said, "You are blessed to see the things you now see! I tell you, many prophets and kings wanted to see the things that you now see. But they did not see these things. And many prophets and kings wanted to hear the things that you now hear. But they did not hear these things." The apostles were common men given an incredible blessing. They were blessed to be able to see God's ultimate promise delivered, fulfilled, and embodied in Jesus. We have received their testimony to this Word, this fulfillment to his promises, in the Gospels. We are incredibly blessed, indeed. Jesus is the tuning fork of all revelation and the fulfillment of all of God's plans. If we are going to understand Scripture and God's plan for salvation, we begin with Jesus. Let's rejoice at the privilege of living in the light of the glory of Christ. Father, how can I ever thank you properly for the incredible grace of knowing Jesus, and in knowing Jesus, understanding your incredible love and grace? Never let me lose my sense of wonder at knowing Jesus, in whose name I offer my devotion, thanks, and praise. Amen.